Playa del Carmen, one of the world’s most perfect beaches and located on the mainland directly across from the island of Cozumel, has grown from a little village to a major tourist destination on the Mexican Riviera. It has turned into one of those places where your dreamed destination wedding will make a difference. This marvelous white sand beach bathed by clear turquoise waters and away from everyday stressed life will make your dreams come true. The most popular travel destination in the Mayan Riviera is Playa del Carmen. It is only 45 minutes from Tulum ruins and Cancun. Here you will find lots of fun and a great place to mix with interesting people from around the globe. Its location makes it accessible to lots of places on the Mexican Caribbean coastline. A destination wedding in Playa del Carmen, with plenty of beautiful beaches and many entertainment options, will fulfill your expectations. Playa del Carmen’s beaches extend northward and southward from the ferry docks that are south of the city. To the north of the docks, you will find a picturesque city and a beautiful beach dotted with shops, bars, hotels and restaurants. To the south of the docks, the beaches are wider, quieter and less crowded. Playa del Carmen beaches are clean and well-kept, and there are lifeguards on duty up and down the beaches. The local police guard and patrol the beaches, so there is almost no crime. Most of city's resorts are located in the central stretch of beach that starts near the ferry dock or just a few steps away, such as Bahía Príncipe Hotel, just 20 minutes from Tulum and one of tourists’ favourite, as it offers guests excellent accommodation. 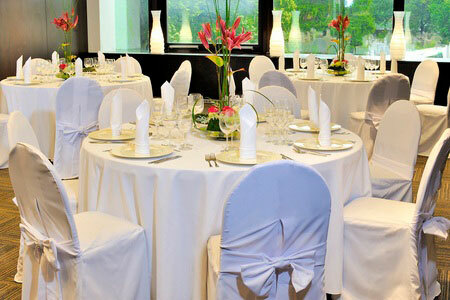 The resort’s facilities and excellent service make it ideal for your destination wedding in Playa del Carmen. Along with the main beach, you'll find some other beaches that are named for nearby resorts with a romantic atmosphere and distinctive all-inclusive experience that make them perfect for your destination wedding in Playa del Carmen. You will also find numerous beach clubs that have plenty of lounge chairs, daybeds, palapas, restaurants and bars and offer water sports equipment rental. Apart from the surroundings, one of the most important aspects to consider when planning a wedding is the resort you will stay at. All-inclusive-weddings.com would be happy to help you find the ideal accommodation. Our experienced staff will guarantee you make the right decision. In this destination with sun, sand and ocean views you will relax in its Bohemian atmosphere, enjoy a tour to the Mayan ruins, a dive trip to the renowned coral reef off Cozumel Island, a day of offshore fishing, as well as any of the water sports available, such as swimming, kayaking, sailing, or parasailing. Cruise ships also stop in Playa del Carmen to allow their vacationers to take advantage of great food in amazing restaurants and great shopping including numerous jewellery stores and arts and crafts stores where you can find many great deals and that can be found along Playa del Carmen's “5th Avenue”, a tourist zone located just one block off the beach and next to the "Zocalo" or Main Square; in Playa del Carmen you can also enjoy its fantastic nightlife. Playa del Carmen has choices for the most demanding tastes. Its genuine Mexican style makes it a charming spot for a fabulous Playa del Carmen destination wedding. South of Playa del Carmen, just next to it, is Playacar, an upscale development designed to create a stylish environment with many five star all-inclusive resorts and a challenging world-class golf course, one of the best in the Mayan Riviera. Within Playacar are small Maya archaeological sites located around the area and the Xaman-Ha Aviary that has exotic Toucans, Scarlet Macaws, Green Parrots and Pink Flamingos in an astonishing natural setting. If you have thought of having a unique destination wedding in Playa del Carmen, tell our experienced planners what your idea is and they, together with the wedding coordinators on-site, will help you customize your destination wedding and make this special event a perfect one, just the way you have dreamed it.